Lot:9423 Fr. 2201-Algs. 1934 $500 Federal Reserve Note. PCGS Currency Gem New 65 PPQ. Fr. 2201-Algs. 1934 $500 Federal Reserve Note. PCGS Currency Gem New 65 PPQ.emThis 1934 Boston Gem $500 Light Green Seal is the first of five stellar rarities in our auction tonight with provenance to the Stradivarius Gem District Collection of $500 LGS. The Stradivarius Collection is the only complete Gem District Set of $500 LGSs ever assembled. Each of the five Stradivarius notes in our auction are unique Top Pop One of a Kind Gems, so no other Gem District set of 1934 $500 LGS can be made without these five notes, a fact we suspect is not lost on would be bidders aspiring to make a sweep all five gems in our auction tonight./empThe ink color used for the treasury seal & serial number overprint on Federal Reserve Notes changed from dark green to a light, lime green. The change of ink color was mere happenstance, a function of the competitive bid process whereby the Bureau of Engraving & Printing solicited bids & awarded purchase contracts to vendors with the lowest price. 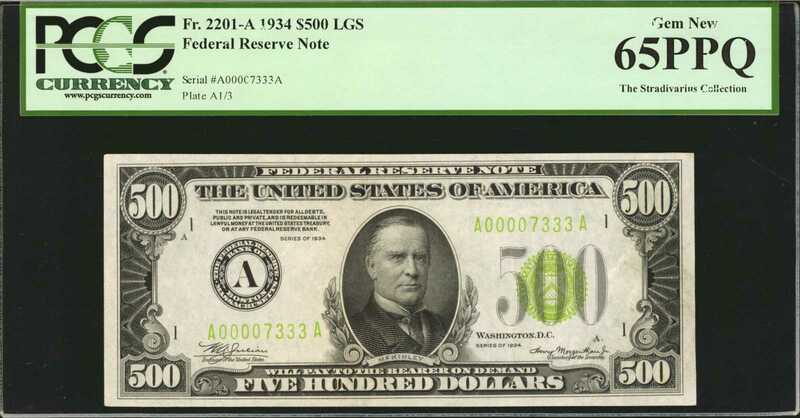 In 1938, the ink color on Federal Reserve Note seals & serial numbers changed again, this time from lime green to a pale blue/green, making Light Green Seals a very short-lived variety. Fewer Light Green Seals than Dark Green Seals were printed due to the short interval of time that the Lime green ink was in use at BEP, & Light Green Seals were printed & released into the channels of commerce much earlier than their Dark Green Seal counterparts, so many were culled from circulation & destroyed due to excess wear/damage. Because of these factors, Light Green Seals are much less common than Dark Green Seals even in circulated condition. In Gem, LGS are rarities; in fact that four districts - Boston, New York, Atlanta & Dallas have only had one gem graded, per PCGS & PMG Pops. This extraordinary 1934 $500 LGS Boston Gem has maintained its preeminent position as the only known surviving 1934 $500 LGS Boston Gem at either grading service ever since PCGS & PMG were established over 14 years ago. It is noteworthy to add that PCGS & PMG have not graded any $500 1928 Boston $500 LGS Gems, making our 1934 $500 Boston LGS the only Gem Boston LGS type note available for both 1928 & 1934 $500s.ppOur delectable, $500 Boston LGS Gem is a masterpiece of dazzling color, balanced margins, & awe-inspiring originality. Any estimate of this note must consider that this may well be the only known Boston Gem $500 that survives. PCGS Pop 1/none finer.pFrom the Stradivarius Collection.